Danny Boyle is a very interesting director, the guy enjoys delving in and making intelligent and engaging genre films as he has tried his hand at horror (128 Days Later) and sci-fi (Sunshine) but upon viewing those earlier films I don't know that I would have ever expected Boyle's career to make the turn it did with "Slumdog Millionaire". I enjoyed that film immensely and though I didn't necessarily think it deserved best picture the year it won, I couldn't disagree with the fact it was visually stimulating and a well told love story that really rejoiced in the emotion. With his follow-up being another kind of Oscar-bait film, I have been eager to see if Boyle truly found something to match his niche here or was he simply trying not to stray too far from his current path and let audiences know that "Millionaire" was no fluke. Turns out Boyle knew exactly what he was doing and I don't think the man cared if "127 Hours" was nominated for zero awards. The film is his imagining of what it must feel like to be stranded, desperate, and to find strength in the most unbelievable of places that force a human being to survive. It is just as inspiring as his last film and equally as stunning visually. The story and the landscape it provides are like a playground for Boyle's directorial eye. The story is simple, and we all know what it is and how it will end. Going in, this was my biggest concern. How can a film where the audience already knows the ending with a plot that already feels thin turn out to be anything but? What Boyle and his lead actor James Franco are able to accomplish here is a real testament to their talent. Boyle finds numerous ways to shoot his solitary character in the same position, inserting dreams, flashback, mirages and premonitions throughout. All tinged with an almost burnt out color scheme that enforces the climate around this man. What Boyle does realize is that this story is more about the psychology behind its success than the actual act of what Aron Rolston had to resort to to free himself. Hence the flashbacks, dreams and whatnot, but when we hear Franco as Rolston give a voice over about how this rock has been waiting for him his entire life, that this moment had been destined even before he was born, we understand the kind of thoughts and pondering a man in such a situation begins to go through. And from that we see the investment that Franco has made in Rolston, he becomes the man and gives a great performance that truly takes us on this journey with him. It could not have been easy for Franco to go through such a wide range of emotions when surrounded by no one else, with no others to play off, but like Ryan Reynolds did in a similar role in "Buried" Franco completely captures our hearts and gives what is no doubt a defining moment in his film career. What "127 Hours" does best though, is take an extraordinary event and turn it into a film that encompasses every emotion that Rolston goes through as well as the reason, the push behind what he did, what he was forced to do to survive and what he decided was worth living for. It is a truly rousing story of not only survival but about life and all that we don't realize when we have it all. What it is like to get a glimpse of life when everything has been taken away from you, what it is like to be so close to death you simply cannot accept it. 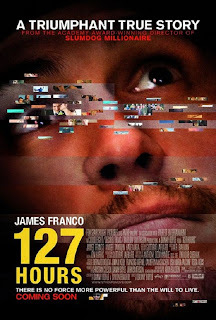 If I have heard any complaints about this film it is usually that it is more about the aspect of filmmaking than it is the story but while Boyle obviously makes some bold choices here, using things like split screens, bold music choices and odd camera angles but I never felt as if it overtook the emotion and the story the film was trying to tell. It starts out giving just the right impression of busy and non-stop people going about their daily duties only to make the seclusion of the bulk of the movie even more affecting. 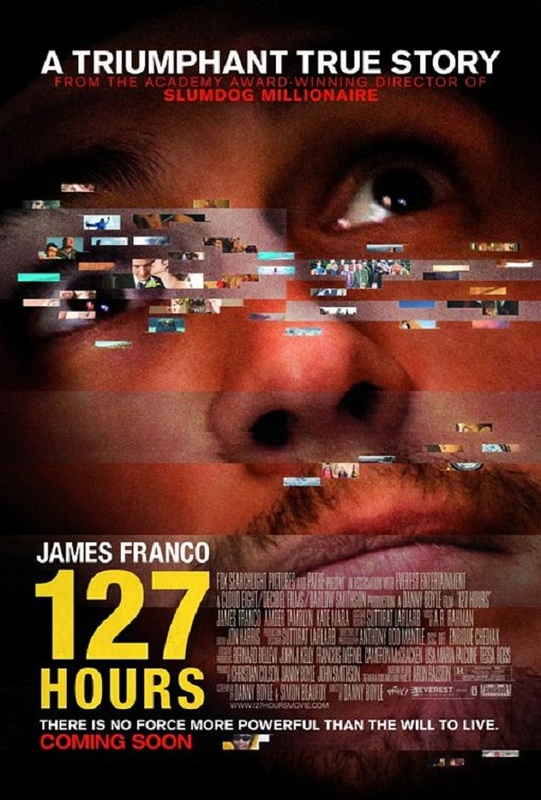 It uses its camera movements to emphasize the severity of Rolstons situation and while it is mostly due to Franco's performance that this film succeeds as well as it does, without Boyle's creative force behind the camera the film would have most likely felt more of an actors showcase rather than a testament to a man who overcame insane odds. Yes, Boyle invests heavily in filmmaking techniques, but they never made themselves more relevant than the fact that what we were watching was really about a man and his journey to live. It is inspiring and would have definitely been on a Top 10 list had I seen it earlier.